The distribution, location, and extent of the uses of land within the Plan area. Details for major components of public and private transportation, sewage, water, drainage, solid waste disposal, energy, and other essential facilities proposed to be located within the area covered by the plan and needed to support the land uses described in the plan. Standards and criteria by which development will proceed, and standards for the conservation, development, and utilization of natural resources, where applicable. A program of implementation measures including regulations, programs, public works projects, and financing measures necessary to carry out the Plan. A statement of the relationship of the specific plan to the general plan. A Specific Plan should recognize that distinct areas around a transit facilities (as categorized by use, character, density, pedestrian and bicycle connections, parking, urban design or another unifying characteristic) need to be addressed and regulated differently. The areas surrounding a station must be carefully analyzed to answer two key questions: How does the area currently function? How could it change in response to planned improvements? 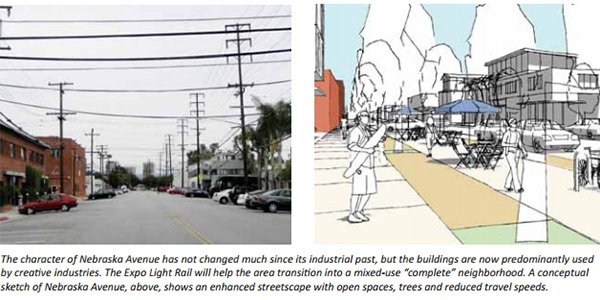 The ability to establish design guidelines through a Specific Plan is also beneficial to transit-supportive places, to ensure quality development that enhances the character of a transit district, downtown area, and the larger community. 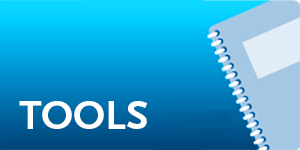 This tool can also incorporate many of the other specific implementation tools in this Toolkit. Standards for higher quality development near transit stations. 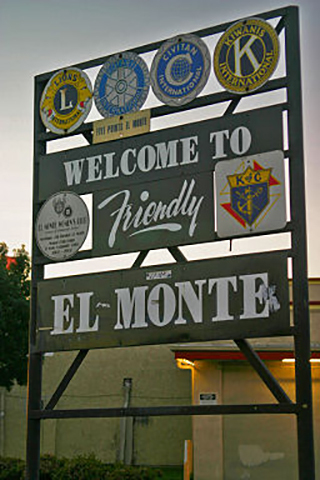 El Monte Gateway Specific Plan. City involvement can make the difference in implementing complex joint developments. 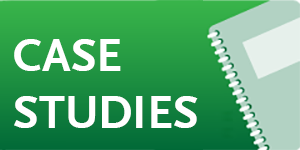 Consider pursuing feasibility studies, even in complex situations. Up-front community outreach is critical. Engaging the community at the start of the process was a key to ensuring that the plan has lasting public support. Key circumstances made bus transit-oriented development possible at El Monte Transit Center. Development around major bus stations works in places that already act as hubs for a larger bus network. Intermodal connections are extremely important for both bus and rail hubs. Commit funding to infrastructure improvements that guarantee the long-term stability of a bus route, such as dedicated lanes and rights-of-way. Realize the economic stimulus and community enhancements the Duarte Station TOD will provide. This Specific Plan is unusual in that it addressed a very small area (less than 20 acres) and the land slated for future development is currently zoned for manufacturing. Moreover, the City lacks a traditional downtown, but the area’s zoning now allows up to 475 new residences, a hotel, up to 400,000 square feet of office and 12,000 square feet of retail, with the hope that this new, mixed-use development will anchor a nascent center of activity in the heart of the City. Santa Monica Bergamot Area Plan. Growth Projections. One of the important contributions of the Area Plan was to complete a buildout analysis for the anticipated residential units and commercial square footage that would be constructed within the Plan area within a specified timeframe. This ultimate buildout allows the city to plan for (and assess fees related to) new infrastructure investments. Tier Strategy. Based on public and stakeholder input, the Plan sets forth a clear relationship between discretionary increases in height and the provision of community benefits in projects. Desired benefits are specifically identified, and tied to bonus amounts of FAR or dwelling units. Congestion Management. The Plan sets up processes for both new and existing developments to participate in TDM programs through the creation of a Transportation Management Agency (TMA). The Plan includes almost 30 Transportation Demand Management (TDM) strategies, in the service of the ‘no net new trips’ goal. Urban Sustainability. Multitude of requirements for green building strategies, incentives for adaptive re-use and conservation, policies for heat island reduction, and mandatory alternative energy production (primarily solar) for certain projects. Conceptual Master Plans. 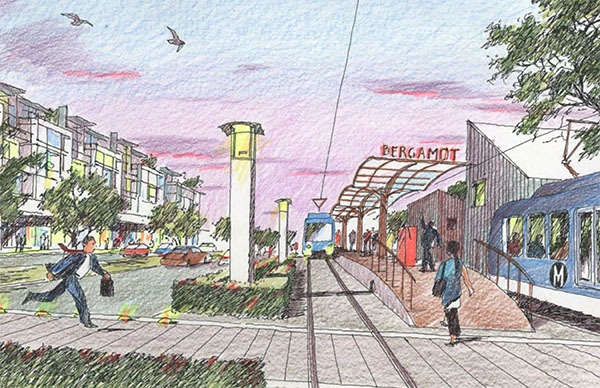 Through various community charrettes and iterative design processes, the Plan developed several site concept options for the reconfiguration of the station area, including factors such as improvements to open space and site amenities, parking provided for existing and new uses, and access to/from the light rail station. Identified various potential funding sources for the project. Washington/National Transit-Oriented Development District Plan. To make this transit-supportive district a success, the City was extremely hands on, shepherding the development along through various barriers and regulatory impediments. Instead of simply laying out the parameters of the district and outsourcing the design and implementation to the private sector, the City guided all aspects of the District’s development. The proposed project, currently in the conceptual design phase, will include residential, office, retail, restaurants, a hotel, and community open space. Central Petaluma (CA) Specific Plan . Good station area plan with development and design guidelines, thoroughfare standards, and historic conservation. West Carson Transit Oriented District Specific Plan . LA County Department of Regional Planning is currently preparing the TOD Specific Plan for the area around the Carson Metro Bus Station, a major transit station situated along the 110 Freeway. It will contain zoning and land use standards, a mobility strategy, an economic development strategy, a capital improvement plan, and urban design guidelines.